Take training to a new level with Bladez exercise bikes. Their club quality indoor spin bikes with aero-style handlebars can be customized with different seats and pedals to make the perfect training cycle. Plus they recently added uprights and recumbents to the mix. Bladez is a division of BH North America, which is part of the BH Group, headquartered in Spain where it began in 1909 as a steel manufacturing company. The BH stands for Beistegui Hermanos (or Beistegui Brothers). An international company with exports to more than 65 countries, the products range from fitness equipment to solar energy. BH North America includes the brand names Bladez Fitness, Ion Fitness, BH Fitness, and others. BH introduced the world’s first stationary bikes with a magnetic braking system in 1992. Since then, BH has continued to be a leader in research and development in sports fitness equipment, and is one of the few companies certified in quality assurance with the ISO 9001 standards. 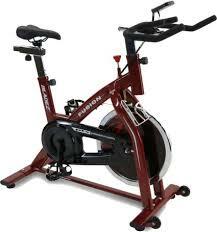 Bladez is definitely best known for their spin bikes, also known as indoor cycling bikes. There are currently three different models to choose from: Fusion GS II, Master GS and Echelon GS. The Bladez Fusion GS II has a 40 lb. flywheel for smooth, quiet motion, chain drive system, unlimited resistance levels, sport pedals, tons of adjustment for customization and a maximum user weight of 275 lbs. The Echelon GS is similar to the Fusion GS II except it has a belt drive system rather than a chain. Otherwise most of the other features and capabilities are identical. The Master GS Indoor Cycle has a 45 lb. flywheel, wireless heart rate monitoring and a heavier 300 lb. max user weight. Bladez bikes are loaded with features and entertainment options. They use steel frames, precision bearings, durable multi-ply belts, heavy-duty cranks, an ergonomic seat, and racing-style handlebars with elbow pads. They feature a paddle style gearshift for resistance control, not a knob like most other spin bikes use. The resistance and brake controls can be detached and moved to wherever you prefer them on the handlebars. The exercise bikes are further customizable in the seat (up/down, back/forth), and the handlebars can be positioned higher and lower as well as in the angle. Unlike other spin bikes, with Bladez bikes you can also swap out the seat, pedals, and even handlebars for road-type drop bars. If you are unfamiliar with Bladez or BH Fitness, you might be surprised at the number of outstanding exercise bike reviews these models get. BH has thought of everything in designing these bikes, from ergonomics and ease of use, to sturdy frames and reliable resistance systems, and even a fast 30 minutes assembly time out of the box. You would expect to pay top prices for Bladez exercise bikes, but most are priced between $299 and $699. Bladez Master Bike - A very good buy at $699, but we would not recommend it at a higher price as there are better bikes out there in the $800 to $1000 range. Bladez Jet Upright Exercise Bike - The excellent reviews and comments on the Bladez Jet are a testament to its outstanding quality and flexibility. 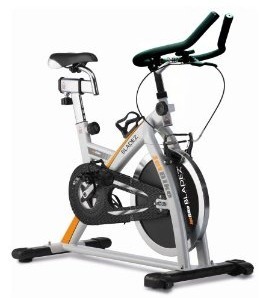 Bladez Aero PRO Indoor Cycle - The Aero PRO Indoor Cycle is a stylish, sleek and attractive spin bike that can hold its own against many higher priced, commercial spinners.